Sleeping Beauty (Buena Vista/Disney, 1959). Starring the voices of Mary Costa, Bill Shirley, Eleanor Audley, Verna Felton, Barbara Luddy, Barbara Jo Allen, Taylor Holmes, Bill Thompson, and Marvin Miller. Condition: 5.0 Very Good/Fine. Condition Note: Small chip out of the left border, but never folded and presents very nice for the condition. Please check out our other posters and lobbies for sale. 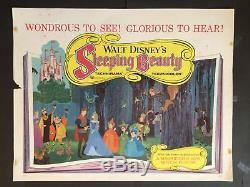 The item "SLEEPING BEAUTY Original Walt Disney Half Sheet 1959" is in sale since Sunday, December 16, 2018. This item is in the category "Entertainment Memorabilia\Movie Memorabilia\Posters\Originals-United States\1950-59". The seller is "showcasedaikaiju" and is located in Norcross, Georgia. This item can be shipped worldwide.